Annual Kiwanis Banquet - 6 p.m.
Do you have old tires sitting at home that your trash disposal company refuses to take? This is your opportunity to have the state dispose of those waste tires for you. Bring your old tires to the KYDOT Hiway Garage - 1.5 miles north of Richmond on U.S. 25. Tires on rims will be accepted. Tires that will not be accepted are: foam filled tires, off-road construction and earthmoving equipment tires and solid tires with pressed on rims. This program will be provided only once and only on September 7, 8 and 9. This disposal service is not available for tire retailers, agricultural tire retailers, and salvage yards. If you have a large number of tires or cannot deliver your tires to the collection site please call the county solid waste coordintor to make special arrangements. Coordinator of this project is Bob Rasmusson 859-624-4709. Selling the Bluegrass as a region is one such project. This Bluegrass Partnership will initiate a web page to cross promote businesses in the area. Another project is the Discover America video production which will develop a video tape to promote the Richmond area. This tape will air both nationally on the Travel Channel and on a loop for a month on Adelphia cable. Pre production costs for this tape will be $15,000. The Richmond Battlefield Project which is being co-chaired by Kiwanian Tracy Burdett and on which Kiwanian George Ridings is also a member. This committee is formulating plans to develop grants to support the development of a battlefield center to provide in information to the public about this important Civil War conflict. The National Park Service and the Kentucky Heritage Council have recognized the significance of various aspects of the project. The Park Service recently approved a $25,000 grant to support a Chamber of Commerce/Madison County Historical Society proposal to develop a preservation plan. A community-wide meeting will also be conducted to discuss what portions of the battlefield needs to be preserved. The Bluegrass Army Depot, which have many unearthed artifacts from the battle will have an important role in this discussion. Rumpke, who also serves as chair of the Bluegrass Workforce Investment Board, will also be consulting with local businesses to determine what can be done to train an outstanding workforce. This page will get viewers to a list of current members and if those members have email the viewer can click on the name of the member to automatically send them email Eventually the list of members will have photos of each member next to their name to aid members in identifying club members in our ever growing club. 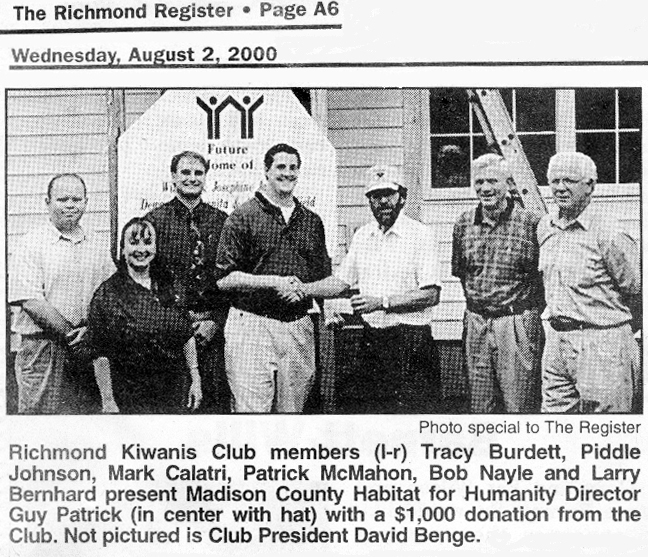 Also on this page are connections to Richmond Kiwanis monthly newsletters which outline the many contributions and fundraisers of the club. This way members can check the schedule for the next meeting if they have misplaced their monthly newsletter. The web page also includes links to information on Kiwanis and links to the international office and other Kiwanis clubs.